MILFORD, Mass. – For Milford, the initial feeling was like sailing into uncharted waters. For only the second time in two years, the Scarlet Hawks walked into a game coming off a rare defeat. Tuesday's loss to Hockomock League rival King Phillip put an end to Milford's extraordinary 43 game win streak that dated back to early April of 2017. On Thursday, the curious ones settled in to see how Milford would fair in this anomalous situation against Hockomock League (Davenport Division) foe North Attleboro. For the second straight time, Milford came up on the short end as North Attleboro scored three in the top of the ninth to come away with a 7-4 victory over the Scarlet Hawks. In a game mirroring a postseason-like atmosphere, North Attleboro continued to hold down the fort before finally pulling away late. In North Attleboro's prevailing frame, it had a runner on second base with two outs. That is when the fireworks began. A ground ball single by Olivia Capoblanco plated Munley with the eventual game-winner. But the Red Rocketeers weren't done yet. 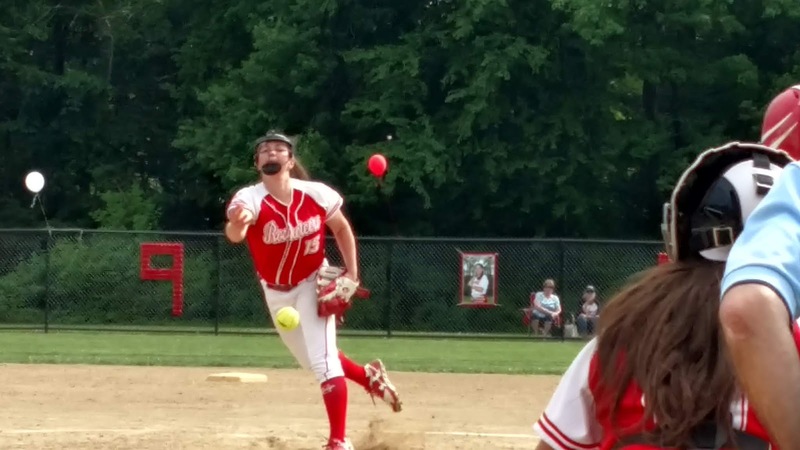 After Capolanco stole second, and advanced to third on a throwing error, the junior came home on Abby Gallagher's infield single to put North Attleboro on top by a pair. 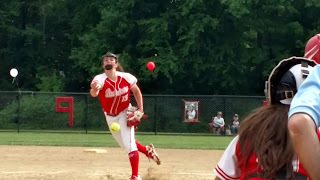 Sophomore Ashley Cangiano allowed the frame to continue by grounding a double down the left field line, sending Gallagher to the plate to make it 7-4 North Attleboro. "This game was getting so crazy," Cangiano said. "I just went to the plate in that ninth inning thinking I've got to get a hit. I think we showed today that we are a team that can compete with anyone and it now gets us ready for the playoffs." In the bottom half of the inning, winning pitcher Bella Erti surrendered a one-out double to Jess Tomaso. Showing no signs of panic inside the circle, the sophomore next retired Shannon Cormier and Sabrina Haarstick in succession to finish things off.. The right-hander allowed 12 hits, striking out five and walking just one. The Scarlet Hawks jumped on Erti for two runs in the top of the first. Kate Irwin opened with a single. One out later, Piergustavo smashed an opposite field triple to right field for Milford's first run. Tomaso followed with an RBI ground out. Reichert (11 hits, 7 K's, 3 walks), meanwhile, held North Attleboro in check over the first three innings. But the Red Rocketeers finally got to the senior in the fourth. Gallagher opened with a walk and moved to second on a wild pitch. Erti then reached on an error before Gallagher crossed the plate on Ananbelle Hebard's hard single. With Emily Pastore running for Erti, the senior sprinted home after Katy Daby's hard grounder was misplayed. deadlocking things at 2 apiece. As they are so apt to do, the Scarlet Hawks re-took the lead in the bottom of the fourth. Antonia Bonina's two-out, run-scoring single moved Milford back in front 3-2. An Irwin bunt single was soon followed up by Bonvino's hard single off the right leg of Erti, sending Bonina home with the fourth run. However, North Attleboro, un-phased by the deficit, continued to battle. The Red Rocketeers struck for a run in the fifth thanks to Cangiano's two-out RBI single. In the sixth, they were able to square things once again at 4-4, on a Mulaney RBI base hit. "We changed our batting practice routine a little bit these last two days, said Wallace, whose team came up short in an extra-inning contest against Franklin on Monday. "But everything is up to these girls. They are the ones who go up to the plate and do it. This is a just a great win against a great program." In the last half of the seventh, Milford had a chance to win it. After Erti set down the first two batters, Reichert connected for a double off the left field fence. But Erti was able to bear down by fanning pinch-hitter Carly Ferreira to send the game to extra innings.